Asclepius Health™ is a healthcare transformation organisation, focused on the reform of health systems to provide quality, efficient, cost-controlled medical services, through an alignment of clinical and executive leadership. Asclepius HealthTM was formed following the recognition for the need to transform governance and leadership in the health sector. Following a successful regional public health reform, Dr Martin Cohen is sharing a revolutionary model for aligned management accountability, budgetary control – and ultimately, better health care to the Australian community. Asclepius HealthTM present this opportunity through its Integrated Governance Program. In an environment where medical costs are escalating, the tendency to centralise authority to increase cost controls runs the risk of alienating the clinical workforce and producing negative behavioural developments in lead staff. Through the introduction of operational and governance integration, decentralised operational authority creates more responsive clinical units that can be simultaneously and rapidly activated to be nimble and respond to political, fiscal or health changes, that require a safe but rapid change in the clinical, governance and operational approach outcomes. In the public system, the pressure to manage costs, enhance staff morale and drive for better outcomes frequently leads to the adoption of recurrent system review and reform. These processes take years to complete and at the time of completion are often outdated owing to environmental or evidence based changes. This is an unsustainable approach to the business of health and is the antithesis of the drive towards integrated care, which requires system elements to be responsive, nimble and safe. In the private health system, clinical governance varies, and the link between the autonomous senior clinicians and the organisational imperatives are often misaligned, aside from key cost drivers. Additionally, the likelihood that re-admissions, misadventure and unforeseeable complications are not passed out in this sphere of care, may well lead to significant disenchantment with the system, by both patients, and clinicians. A cost control approach that can be applied in a flexible but responsive manner, with strong integration across operation lines is the key to ensuring strong outcomes, governance and value for money. At Asclepius Health™ we believe that change requires new business models that are leaner, faster, and more decentralized. The need for complex and centralized bureaucracies are obsolete – our goal is to push capability to local teams who are empowered to take accountability for performance and to those individuals and teams who become ultimately responsible for outcomes. Our professionally supported approach to change – naturally generates benefits well past the original financial targets identified. 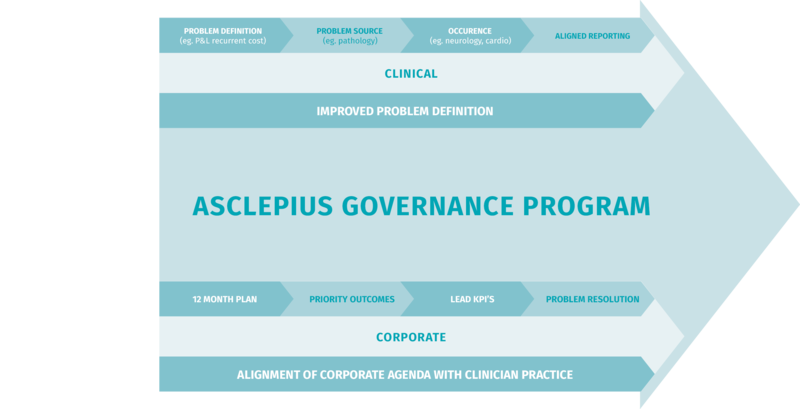 The Asclepius Health™ program is not a “once off” process, but a true re-alignment of management systems to create a change in clinical and operational culture, with support system stability, creating a governance model that becomes functionally “sustainable”. Targeted capability to redirect existing resources to areas in need of redirected funding, through accountability management and performance metrics that sustain fiscal performance across time. Removal of Budget Deficits (Black Holes) through structural alignment of governance and operations to drive performance management strategies. Cost control strategies that engage clinicians in the process of fiscal accountability. Improved Budget/Cost Management by Clinician Leaders. Alignment of Operational and Clinician Frameworks, enabling a partnership between management and clinical leaders to achieve clinical and fiscal outcomes and enabling translation of evidence base into practice.